I put garlic and onions in almost everything I cook, not just because of the flavors, but the benefits of garlic and onions as well. I used to think of garlic as an herb mostly used in Italian cooking. Then I learned it’s actually the most frequently used vegetable in the world. Garlic is considered an herb because of the way it is used in cooking. Though you could eat it as you would most other vegetables, most people find that unbearable, due to the heat found in raw garlic. It is much more easily digested after it has been cooked or paired with something much milder, like an oil. That bearable heat, though, is one of the main reasons garlic is so good for you. It burns fat, thus naturally boosting your metabolism without any effort. The benefits of garlic don’t stop there. It’s no doubt you’ve heard garlic is good for your heart. Did you know it’s also a natural antibiotic, blood sugar regulator, and cancer inhibitor? 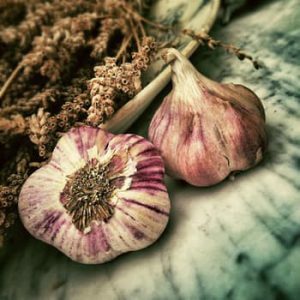 The benefits of garlic span far beyond just being a flavor in spaghetti, and I would love to hear how you all are using garlic both in and outside of the kitchen, below. I love this article, because I love garlic and I agree that it has huge benefits. I didn’t realise how many though! I love roasting whole bulbs of garlic and squeezing the cloves out into salads. Plus I use garlic much like a herb in so many different dishes. Some people, I have known, experience bloating and gas from eating a lot of garlic, do you have any knowledge of this? Roasted garlic is so good! Don’t tell anyone, but my roasted garlic rarely makes it on top of things. I just eat it like that. Intolerance to garlic and onions is pretty common. I find this interesting as both are used a ton in all types of cooking. In short, it usually comes from an allergy or gastrointestinal disorder, like IBS. In my experience, taking a probiotic greatly helps with this. Alternatively, the person could try to pair the garlic with other herbs that aid with digestion, like basil and cumin. Taste-wise, both pair well with garlic. I put Garlic in nearly all my cooked dishes, but in moderation. I am not too keen on the smell, but love the great taste it gives food. Most of the times I use dried Garlic flakes. The kind you buy in a spice bottle. Can you tell me if dry Garlic flakes have the same health benefits as fresh Garlic? I know Garlic is a good insect repellent, but did not realize you can use Garlic for snake bites. Can you maybe tell me a little bit more about that? Thanks so much for stopping by. I absolutely love your questions! Let’s get right to it. I understand not wanting to smell like garlic or even not loving the scent of it. For me, it’s a smell I love in cooking, but I don’t really want my house or myself smelling like it after cooking. Rest assured, as long as you’re not going crazy with the herb, you’re not going to stink things up. This of course also depends on how you’re using the garlic. For example: buttered spaghetti with a little salt, parsley, and garlic is going to be way more pungent than say a grilled steak seasoned with black pepper, onion powder, rosemary, and garlic. It’s all in how you use it. Similarly, individual body chemistry plays a role. I can chop fresh garlic all day and never smell like it. Conversely a friend of mine can simply touch a bulb and smell like it for three days. I’ve noticed the different forms of garlic tend to affect the pungency of its smell, as well. Herbs can be expensive. Often I find myself purchasing fresh and powdered garlic because of this. The latter, of course takes more to season with due to it lack of freshness. The same is true of the health benefits. In general, fresh is always better. The more we process a food, the more nutrients it loses. Thus, the powdered garlic has fewer nutrients and therefore benefits than the fresh. The same is true for the garlic flakes you mentioned. The flakes have about a third less nutrients the the fresh. 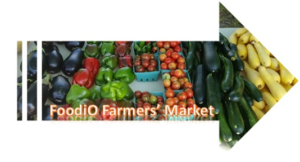 In some areas, such as manganese, B-6, and Vitamin C, the nutritional content is even less (one-fifteenth,one-eleventh, and one-ninth, respectively). It’s far better to just opt for the fresh when you can. You should also find you can use less AND smell less of that stench you don’t care for, too. Most definitely, you’ll want to use fresh garlic as insect repellent and for snake bites. Of course, you’ll need to seek medical attention, if you encounter a snake bite of any type. However, sometimes we have to make due when the hospital is far away. Garlic can be applied (crushed and rubbed) to the area where a snake has bitten, or a scorpion, wasp, or bee has strung. In short, the herb helps to slow the poison traveling into the system. Regardless, of this treatment, you STILL NEED TO SEEK MEDICAL ATTENTION. The good news is by simply consuming garlic, you are naturally reducing your chances of being bitten by pests, including the ones above. You are also reducing you chances of getting lice and fleas. I hope you find this response super helpful, Rika. I look forward to seeing you here again soon!